Cheese Jesus of Milwaukee (most popularly known as Cheddar Jesus or Cheesus ) is a popular action figure sold by Pizza Hut. It is classed as a minor Jesii due to slightly undersatisfactory quantities of bejesus and, as such, can only perform seven minor miracles. However, that's still seven more than pepperoni can muster. Proof that Jesus is a Green Bay Packers fan. Pizza Hut refuses to give out the full ingredients of the Cheese Jesii, fearing that might bring on the Second Coming a bit earlier than expected, preventing them from releasing the new, improved Stuffed Cheesus Chrust™ next year. However, a slice of Cheddar Cheesus has been analysed by scientists with nothing better to do, and they have discovered that the principle ingredient of all Cheese Jesii is, in fact, cheese. This scientific revelation was so important that five of the six scientists working on this project were promoted into upper management a day after the release of these findings. 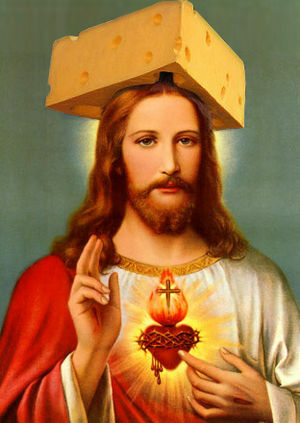 Cheesism is not the religion that worships the God, Cheese Jesus. Crispianity is. When Cheesus was born, he was given different types of cheese from the 3 Blind Mice. They have made many movies about Cheesus, including The Cheesetrix, where the main character, Cheo, is The Cheesen One. Because he is very wealthy with fridges and fridges full of valuable Cheese, he can afford to drive around in his car called a Cherrari. Cheesus' arch nemisis is The Chevil, who lives in a hole underground. If a Cherson was evil, they go to Chell. Cheesus was said to be the second person in the Divine Trinity, and also the Messiah (Greek: Chrust) prophesied in the Old Testament (or Hebrew Bible). Cheesus did not die on the cross - instead, he was impaled on a cocktail stick, onto which a pineapple was placed, as if to mock him. Cheesus was brought back to life in a mysterious incident involving a ball of Edam, a small wheel of Jarlsberg, and a spotty man from Scunthorpe called Gerald. Other historians have been quick in their attempts to debunk this theory. For a start, the documents do not note what kind of cheese Cheesus was God of - nor do they explain why someone called Gerald from Scunthorpe was present at his resurrection. However, there is one thing that every historian is sure of - the new, improved Stuffed Cheesus Chrust™ is going to be out of this world! Get your Cheese Jesii from Pizza Hut, without delay! Cheesus Crust is the delicous cheesy snack that Cheese Jesus ate at the Last Supper with his disciples. It's so delicious that it saved me, and it can save you! *Disclaimer - Cheesus Crust may actually make you fat. This page was last edited on 30 July 2012, at 07:47.